1948 Ford F-Series: The 1948 F-Series (F-1 half-ton, F-2 three-quarter ton and F-3 heavy duty) was Ford’s first all-new vehicle line following World War II. The new trucks, called "Bonus Built" trucks, were introduced on January 16,1948. Now, Ford had been producing trucks since 1925, however this marked a huge change for Ford, the F-Series would no longer be a car-based pickup. 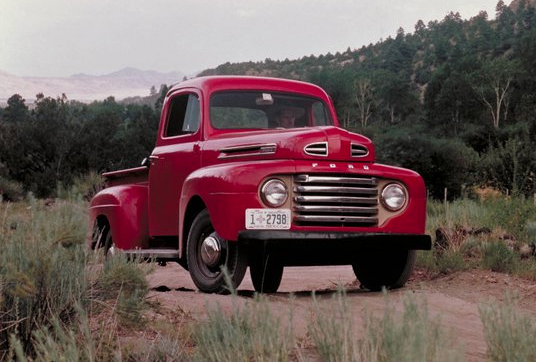 Americans had become interested in trucks for more than just farm work, which helped make the F-Series the most successful vehicle line in history. As of 2018, the F-Series trucks have been America's top-selling vehicle for 36 straight years, and the best selling truck for 41 straight years. Ford sold 896,764 F-Series trucks in 2017! Here is a video of a really nicely restored truck. This isn't our video, but it's definitely worth sharing! The 1948 F-Series trucks were most remarkable for their design while most of the chassis and mechanics were carried over from previous models, with substantial improvements to the engine. Nevertheless, the trucks had the rugged durability required of a work vehicle. They came standard with an in-line six-cylinder, 95-horsepower engine called the “Rouge 226.” For more power, buyers had the option of a 100-horsepower Flathead V8 engine called the “Rouge 239.” A three-speed, floor-shift transmission was standard, with an optional fourth speed. The 1948 Ford Trucks were built at the Highland Park Ford plant in Michigan. Ford marketed this new truck as the "Million Dollar Cab" because they spent over $1,000,000 to redesign the cab. The cab was used on all eight trucks in the F-Series lineup. The cab was more comfortable and roomy than the previous cab. It was seven inches wider, the doors were wider, there was more headroom and legroom, and features other things such as larger instruments, a sun visor, and ash tray . There was also the optional “Spiralounge Seat,” a single driver’s seat with a special hydraulic shock absorber and spring that could be adjusted to the driver’s weight.